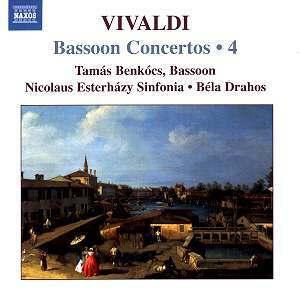 Here, offering a further six concertos, is the latest instalment in Naxos’s recording of Vivaldi’s 37 bassoon concertos; 39 if one counts two incomplete specimens. Those who have invested in earlier volumes in the series (see below), all recorded by the same forces, will know to expect the enjoyable, fluent performances that are to be heard here. The Nicolaus Esterházy Sinfonia use modern instruments but, under the direction of Béla Drahos they play with a crisp articulation that is, for the most part, stylistically convincing. Benkócs is a very fine bassoonist indeed, both technically extremely accomplished and musically imaginative. The outer movements – all six are in three movements, fast-slow-fast – frequently call for considerable fleetness of finger and certainty of breath control and Benkócs is never found wanting. There is rapid-fire virtuosity when needed and many delightfully dancing passages. In the slow movements Benkócs plays with lyrical expressivity, elegantly poignant and reflective in music which, as so often in the slow movements of Vivaldi’s concertos has a distinctly operatic feel about it. Every one of these concertos offers things of real interest – Vivaldi’s musical imagination seems unflagging. There’s the way, for example, in which the opening allegro of RV 477 contrasts the tenor and bass registers of the solo instrument; or the dotted rhythms of the bassoon in the largo of RV 499. Or, particularly pleasant, the final allegro of RV 494 which is full of ingenious twists and turns. It is puzzling that Vivaldi should have written quite so many concertos for the bassoon – the bassoon wasn’t generally a fashionable solo instrument in this period. Perhaps he wrote them for a specific instrumentalist; if so the identity of that musician remains unknown; certainly Vivaldi demonstrates a thorough understanding of the instrument’s possibilities. Whatever the circumstances which prompted the composition of these concertos, they certainly constitute a rewarding body of music and one of the many demonstrations of Vivaldi’s remarkable ability to produce seemingly infinite variations (and there really is variety here) on a basically simple formula. A graduate of the Franz Liszt Academy of Music in Budapest, Tamás Benkócs is a member of the Budapest Festival Orchestra. I haven’t encountered any other recordings by him outside this Naxos series of the Vivaldi concertos. He is such a fine player that it is to be hoped that he will go onto record more of the bassoon repertoire. The one reservation – though it is not one that spoils my pleasure in the CDs – that I about this series concerns the rather understated penny-plain continuo, where the concertos would certainly benefit from greater embellishment. Very decent as the contribution of the Nicolaus Esterházy Sinfonia and Béla Drahos is, I would love to hear Benkócs playing these works with one of the best specialist baroque ensembles. On balance though, this is an eminently worthwhile and enjoyable series, and this latest volume continues the good work begun by its predecessors. The recorded sound is pleasingly clear and well balanced.